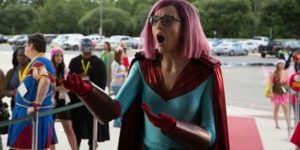 Led by a washed up former child star, a rag-tag group of former TV stars and comic book artists, who make their living working at conventions, decide to steal the loot from a crooked promoter and an overbearing former TV icon who are raking it in at a big comic book convention in the comedy adventure film Supercon. Maggie Grace engages in a little cosplay in Supercon. Directed and co-written by Zak Knutson, the movie stars Ryan Kwanten (TV’s True Blood), Maggie Grace (Taken franchise), Mike Epps (Faster), Clancy Brown (John Dies at the End) and John Malkovich (Red).